Practicing mindfulness helps us meet life's challenges with gentleness and clarity. By fully engaging in the present moment as best we can, we nurture our capacity to approach difficulties with less judgment and water the seeds of wisdom and openheartedness in ourselves. This book offers a concise and thorough immersion in the eight-week Mindfulness-Based Stress Reduction (MBSR) course developed by Dr. Jon Kabat--Zinn. It features straightforward instruction in the main exercises of MBSR -- sitting meditation, walking meditation, eating meditation, yoga, body scan, and informal, everyday practices. MBSR has been shown to help alleviate symptoms associated with chronic illness, anxiety, pain, burnout, cancer, and other stress-related conditions. "This book does a magnificent job of rendering not only the curriculum of MBSR but, even more importantly, its feeling tone, gently emphasizing that it takes energy and sustained commitment to practice and embody mindfulness. I am grateful that this book is now available as a skillful gateway into MBSR, mindfulness, and one's own life in the face of stress, pain, illness, and the human condition itself." "This is a book about how to be in touch, moment by moment, with the actuality of your life, and to do so in a way that is kind to both yourself and others. Based on the hugely influential program of Jon Kabat-Zinn, the book wonderfully captures the essence of the mindfulness approach and promises to excite the interest of a new generation. Both authors are highly respected teachers and teacher trainers in mindfulness. Written in a beautifully accessible style, it will become a vital companion to those who follow its wise guidance. I highly recommend it to you." "Arguably the most concise and revealing description of MBSR to date, this book is the precious fruit of the authors' decades of experience teaching MBSR. Readers will learn the rationale and key practices of each session, see how the sessions are elegantly woven together, find answers to common misconceptions, and discover ways to overcome obstacles to practice. As mindfulness makes its way into all aspects of modern society, this book provides practical and illuminating insight into what started it all." "In their book, Linda Lehrhaupt and Petra Meibert provide a clear compass for anyone interested in enhancing health and wellness by engaging with the practices and principles of MBSR. For those who have already attended and completed the MBSR program, this book can serve to renew, refresh, and reinforce earlier learning. Ultimately, it is a guide for all who choose to live with greater awareness and compassion." "A powerful and accessible book on mindfulness that will serve all." 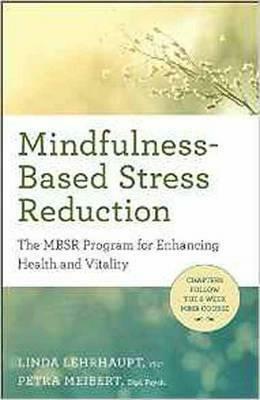 "There are many books on mindfulness ― but this one uniquely offers a clear, session-by-session layout of the MBSR curriculum. The text is brought to life by the examples of the participants' experiences with the process and the authors' experiences as teachers. The book will be invaluable to people taking the MBSR course, as well as to MBSR trainees and seasoned teachers alike." "A relief from the urgency and strains of everyday life." "We can feel the decades of experience inside the MBSR classroom that Lehrhaupt and Meibert call upon as they share the challenges and joys of engaging deeply with our lives that mindfulness affords us. They offer us a book of remarkable clarity and precision about a topic that's difficult to express. It's a powerful reminder of the importance and centrality of turning toward our life experience with nonjudgmental awareness, insight, and curiosity supported by wise teachers and a safe space. It's a great thing when those teachers can reach us from the pages of a book and encourage us onward. As it always is, the time for mindfulness is now!" "This valuable and no-nonsense book will definitely be of great value to everyone exploring mindfulness, whether they are curious beginners, participants of mindfulness courses, or regular practitioners. The wise and straightforward explanations of what this is all about will assist the reader in discovering the basic truths of the practice and the in-depth mysteries that lie at the heart of pure presence. Two experienced and wise teachers are offering their service, and we should all be grateful for their effort in making this guidebook available to us all." "This is a comprehensive and highly readable resource for all those who are contemplating an eight-week MBSR program as well as for anybody who is familiar with the adventure of an MBSR course, teachers and participants alike. I will happily recommend this book to our teacher trainees and participants. It not only guides us in a thorough overview of the journey of MBSR but also shares with us a rich week-by-week description of the process, participants' experiences, and the deep wisdom of two skilled and highly immersed mindfulness teachers." "This is a unique practice book, one to return to again and again. It reveals a series of very practical, powerful practices that anyone can incorporate into their daily life. As pointed out in the book, people who practice them regularly can more easily cope with the stress, strains, and struggles of modern life. For people contemplating taking an MBSR course, this book offers a great introduction and sense of what the experience might be like. For those taking an MBSR course, it will help enormously for exploring the themes presented in the classes. Mindfulness-Based Stress Reduction is a very important addition to the literature for the course." "Linda Lehrhaupt and Petra Meibert have given us a beautifully articulated description of the mindfulness-based stress reduction approach enriched with anecdotes and quotes that bring it vividly to life ― just as the practice of mindfulness can bring each of us fully to life. This book is an accessible and engaging invitation to explore the mindful relief of suffering and stress in a way that also offers the possibility of freedom, contentment, and peace." "In this book, two very experienced practitioners and senior teachers skillfully explain the essence of the renowned mindfulness-based stress reduction program. The result is a wonderful introduction and invitation for those who seek inner ease and freedom from stress and (chronic) pain. The strength of this heartwarming book lies in its simplicity and compassionate clarity. I recommend reading this jewel to anybody who wishes to start and explore this journey." "This well-structured, helpful, and practical book takes readers through the eight-week MBSR course, providing detailed descriptions of the practices and inspiring examples of students' experiences. The authors have distilled their decades of teaching experience and deep understanding of MBSR into simple, intimate, friendly, and accessible language. The book is an embodiment of mindfulness itself." "As a meditation teacher with over forty-five years of experience, primarily in traditional Japanese Zen, I've found this work to be incredibly clear and useful for those wishing to learn more about and practice MBSR. As mindfulness is the foundation of all systems of meditation, this will be a wonderful resource for teachers from all traditions. Congratulations to Linda Lehrhaupt and Petra Meibert for creating this concise guide!" "This wonderful book is very accessible for those interested in mindfulness and MBSR as well as for MBSR teachers in training and trained teachers. Its detailed description of the MBSR curriculum and specific examples are supportive and practical. This book reflects the compassionate tone of MBSR in a beautiful way. It is a gift for all those who are interested in MBSR and who are on an inner journey to deal more skillfully and be more at ease with stress, pain, and illness. May it be of great benefit to all." "What a great addition to the 'mindfulness shelf'! Linda Lehrhaupt and Petra Meibert take you gently by the hand and lead you through the classic eight-week MBSR curriculum. Sprinkled throughout the book are moving testimonies by course participants of how these practices changed their lives. These, plus the authors' personal and professional vignettes, clarify the concepts presented and attest to the power of the approach. Whether you are currently taking the course or you want to reinforce and deepen prior learning, this book is like having your own MBSR teacher standing beside you on your journey to enhanced health and well-being." Linda Lehrhaupt, PhD, is the founder and executive director of the Institute for Mindfulness-Based Approaches and one of Europe's most senior MBSR teachers. Petra Meibert, Dipl. Psych., is a psychologist and one of Germany's leading experts on MBSR, MBCT (Mindfulness-Based Cognitive Therapy), and the applications of mindfulness in medicine and psychotherapy.